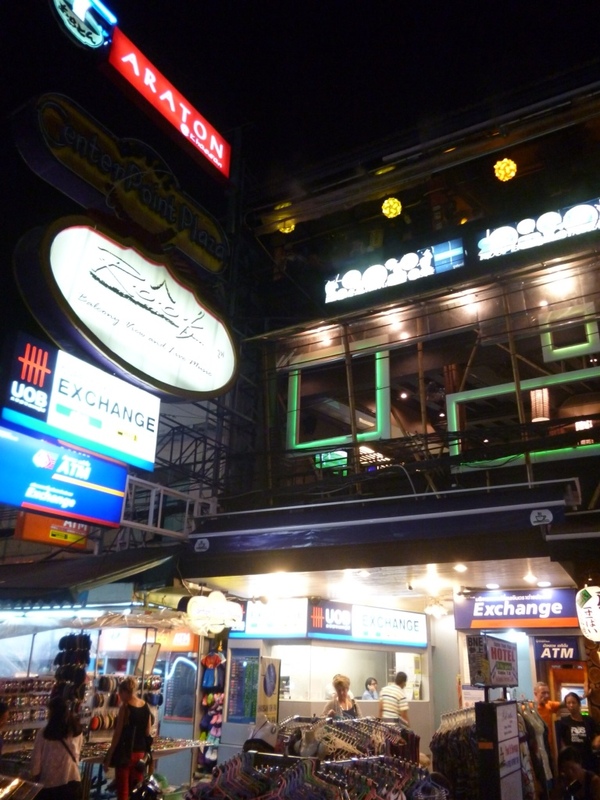 After landing at Bangkok Airport from my 10 hour flight with British Airways, I grabbed a metered taxi from the entrance direct to Khao San Road. 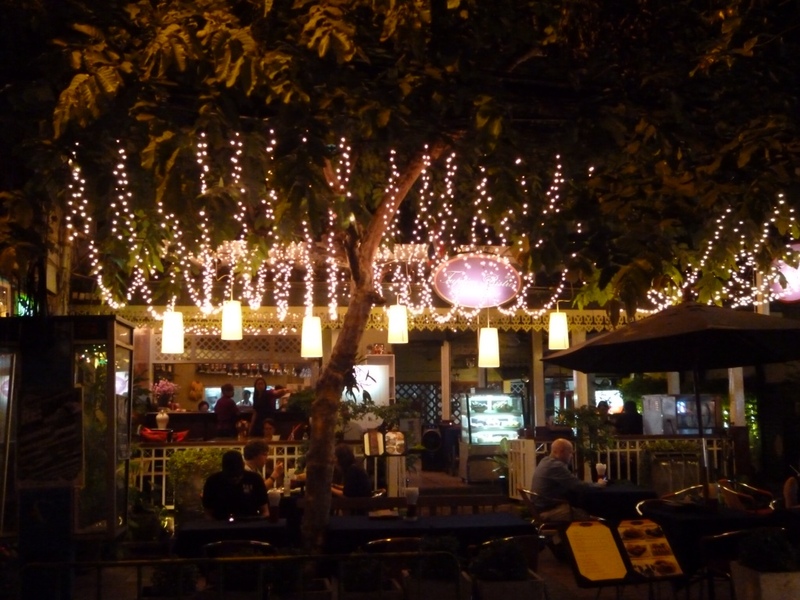 Now, those of you who don’t know about Khao San Road, Susan Orlean (American Journalist) called this a place to disappear. Formerly a vibrant rice market street in the olden days, the last 20 years have seen a transformation to a backpacker ghetto where it offers cheap rooms to rent, an explosion of pirated CDs and DVDs, a centre for all partying and especially a trade centre hawking t-shirts that has slogans on the fun side. Howeve, it does have its plus sides. 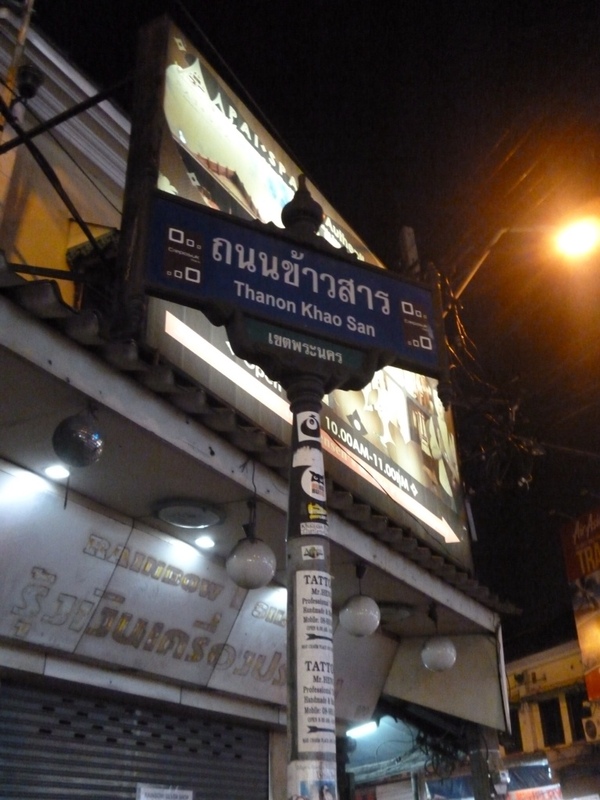 It is now thought of as the travel centre of Thailand as many transport to main Thai attractions leave from this road. 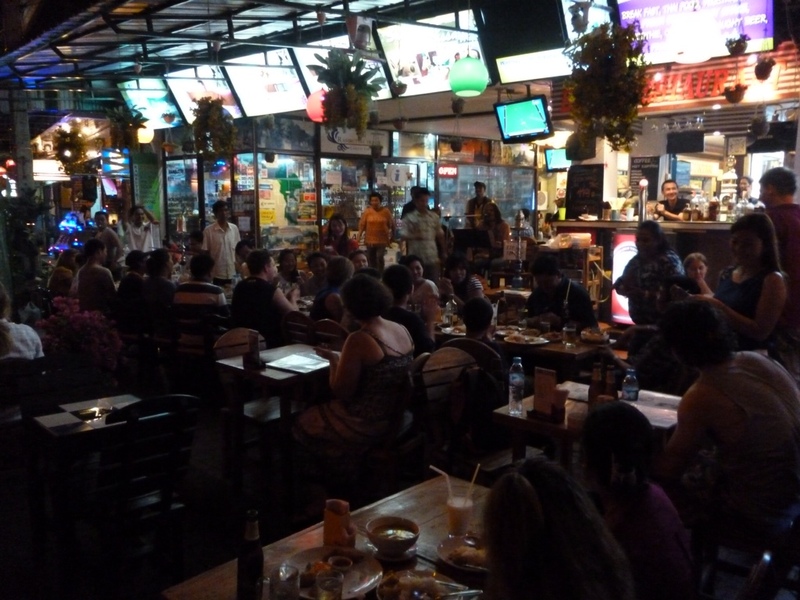 Not only that, you do get the travel community that interacts within each otherin many hostels and also in many bars and cages that bring them all together. 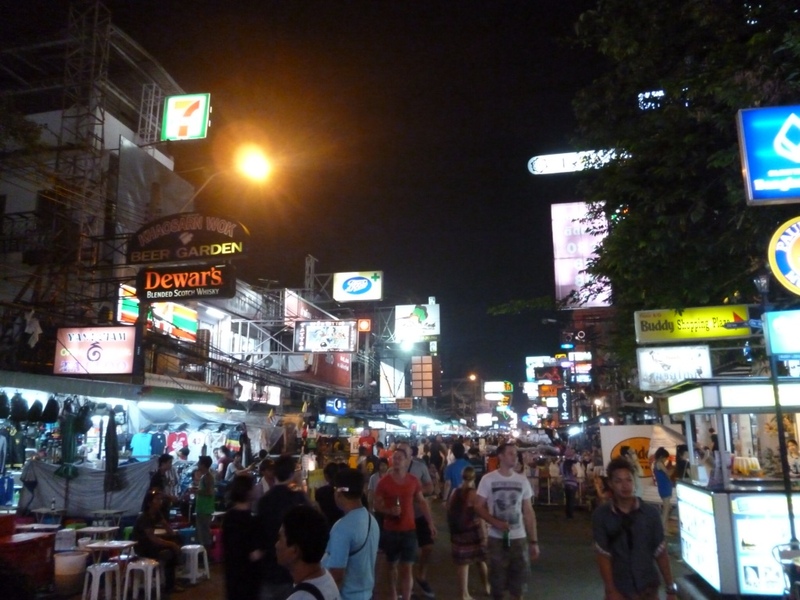 Arriving in Khao San Road, I was faced with a conundrum. Where was the hostel? 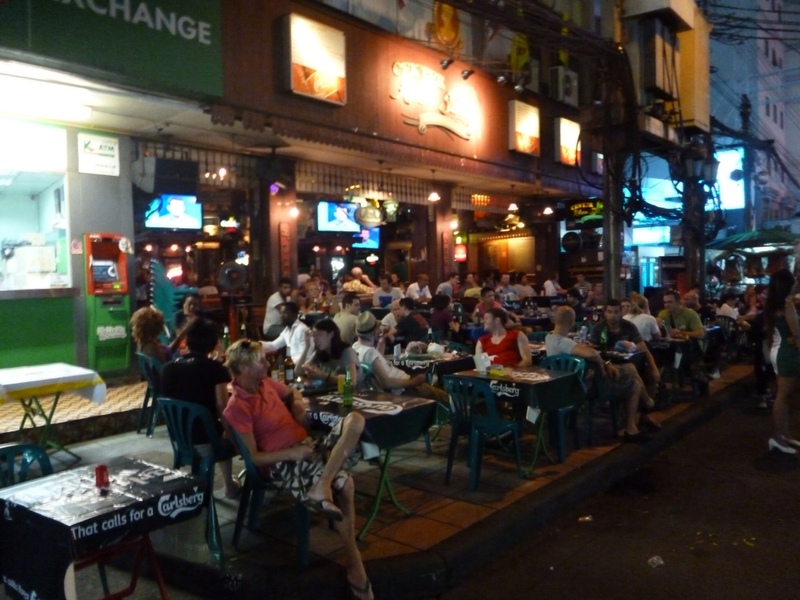 I knew it wasn’t directly on Khao San road but rather 2 streets across but in a navigation system that’s impossible to well…navigate, I decided to point to one direction and stick it out. Luckily, I didn’t feel like a fool dragging the beast of my back, to which I have called Bergen, my backpack, as there were many people doing the same. As predicted, I was going the wrong way but luckily a Thai helped me out and pointed to the road, whose name I spouted out horribly in Thai. He was right. Checking into the hostel. 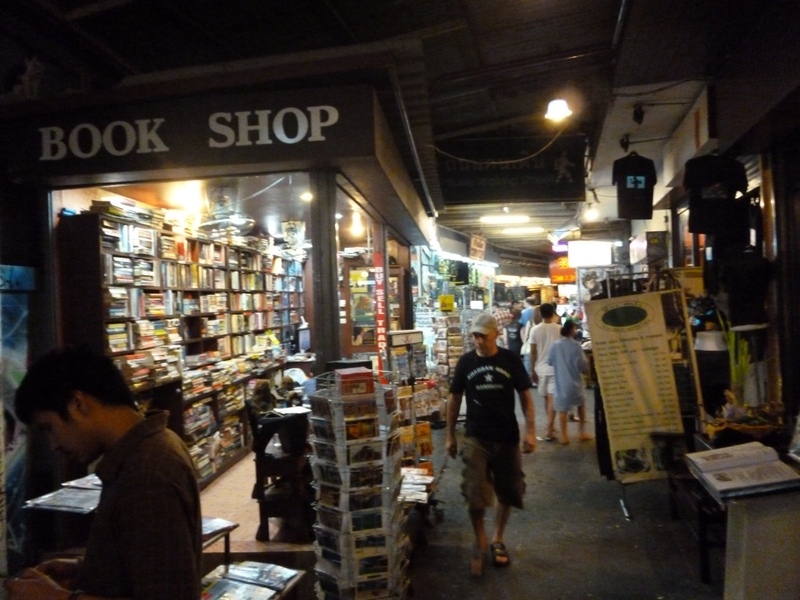 It seemed fairly quiet and several people were watching DVDs in the corner and didn’t look in the mood to say hi! 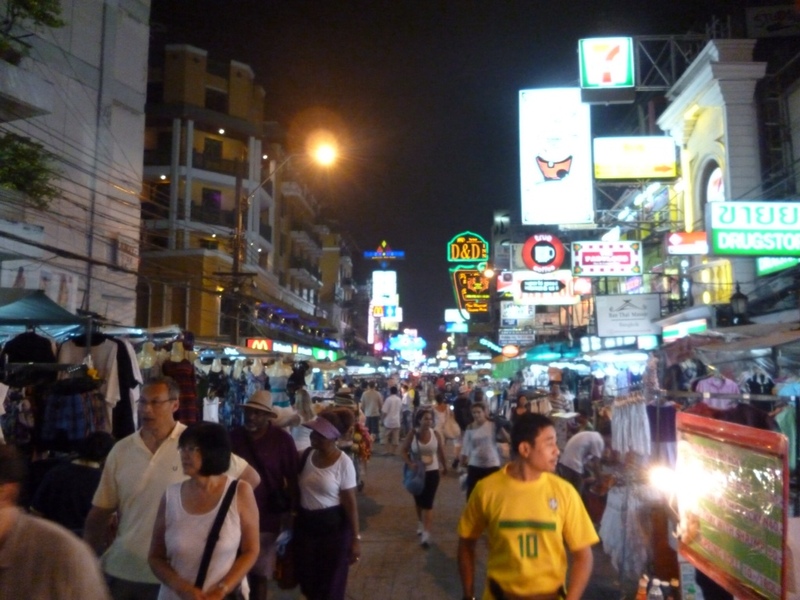 I decided to deposit my backpack in my room, and go down Khao San Road to get my first impressions of the place to disappear. And my it was madness! Check the pics out. 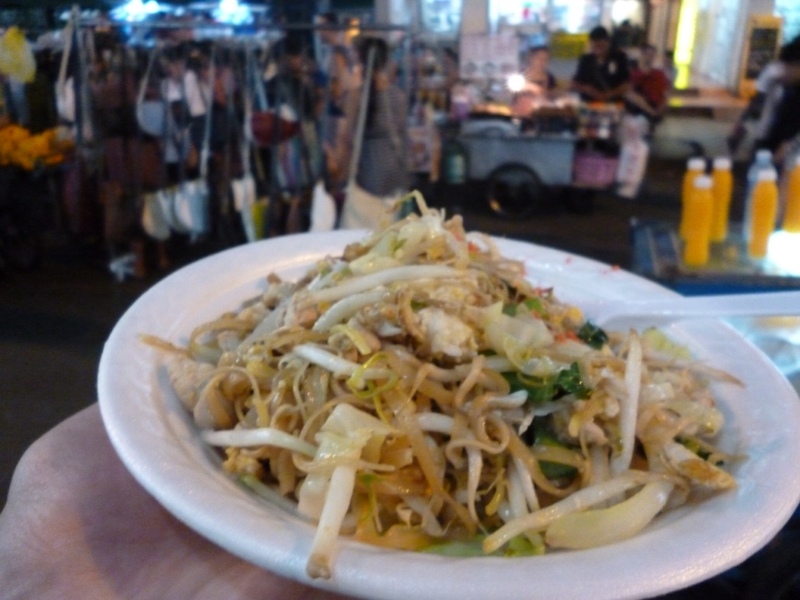 Especially of my dinner – Pad Thai… Nom nom nom! In the end, I decided that it seemed very funfairy, however, underneath was a current of seediness that you may catch in the corner of your eye. 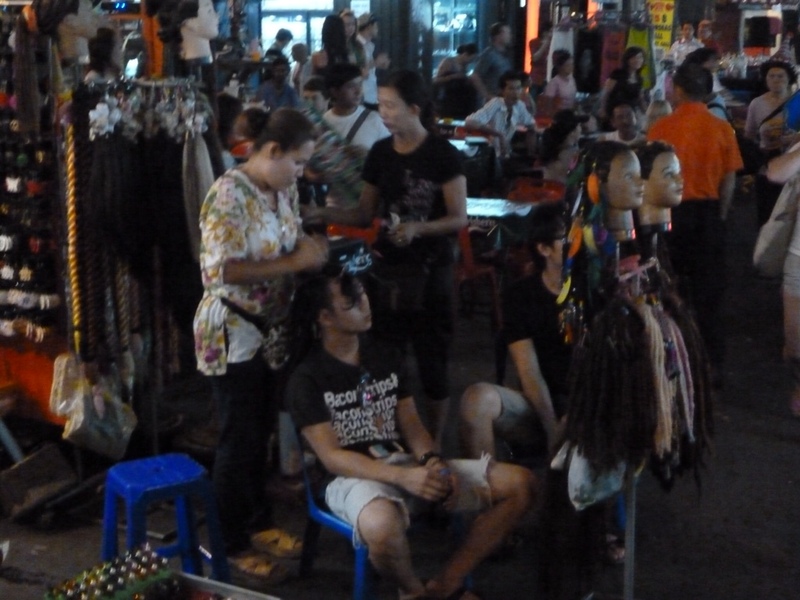 Pretty soon, I was getting pretty fed up of Thai hawkers particularly suit sellers who wanted you to go to the shop and buy something. They kept jumping out at me to the point of grabbing my arm and trying to drag me with them. They aren’t giving me a good impression of Thai people let me tell you that. Suit sellers were the worst of the bunch that include tuk tuk drivers who would rotate their hands over an imaginary motorbike and call out tuk tuk? They would even come straight up to you! 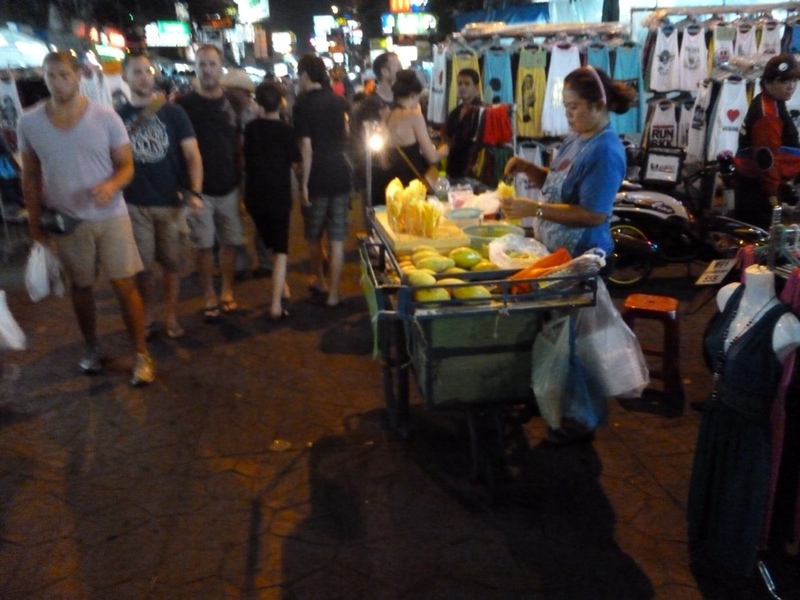 Another line of seediness was the presence of Thai prostitutes hovering around. 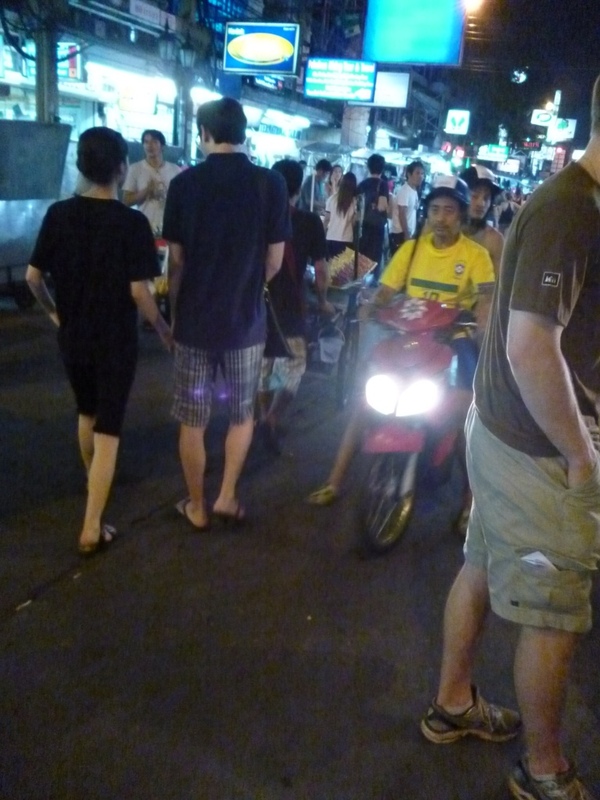 A Thai ladyboy managed to whip round in front of me and after I politely declined, she grabbed me, pushing her away, I was mortified to see her running after me shouting ‘come on! Me give you good time!‘ with a red face, I trooped back to the other end of the road! 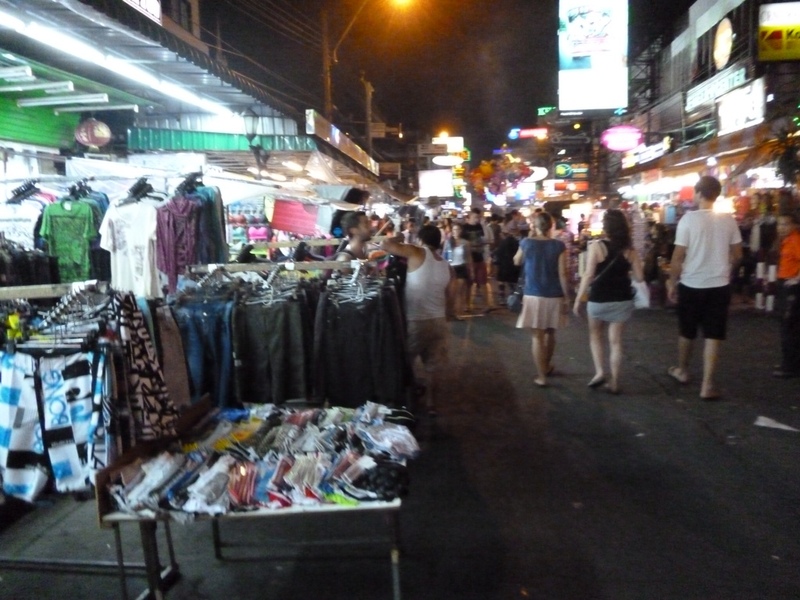 With that thought, I wandered back to the hostel, feeling my flight tiredness creeping in and absent mindedly popped my mouth once to which a Thai man shouted across to me ‘you want see ping pong?’ shaking my head, I think I need my bed after all. Rexy, I have a task for you: hunt down the guy on the left in your third photo. I like his arms. Also, glad you’re having a great (if slightly mental time) in Bangkok – following your edventures on Facebook and the Twitter. Go crazy on the islands!